Tirana was covered all in Red and Black flags for the National Days, 28-29 November 2018. The main activities for the Independence Day were held in the Skanderbeg square. Many children from different schools of Tirana gathered in the heart of Skanderbeg Square signing hymn and patriotic songs. The Mayor of Tirana Mr Erion Veliaj raised in a symbolic way the Albanian flag, while the band was playing the hymn. 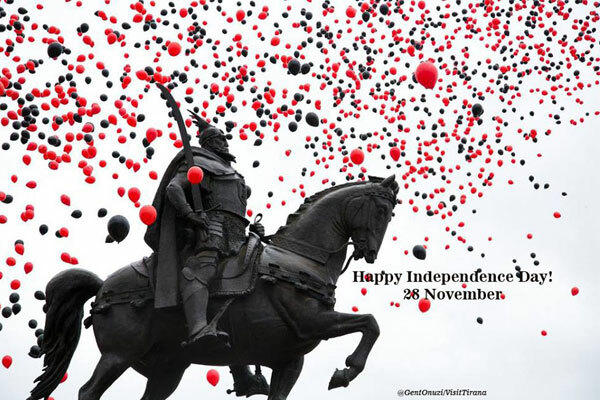 It was a fantastic atmosphere where thousands of red and black balloons flied in the sky covering the statue of Skanderbeg and the whole square. It was a holiday so many people came to the square to this spectacle. While many activities held in Vlora, where the Independence of Albania was declared in 28th November 1912, 106 years ago by the noble man Ismail Qemali. Politicians as every year went to Vlora Memorial of Independence to pay respect for all the men who fought for the Independence of Albania. 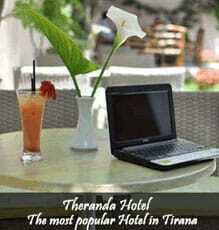 But the other festive activities are continuing in Tirana. This year City Hall has encouraged the citizens of Tirana to hang the flag in each house, kind of a movement: one house-one flag. Who was in Tirana could see many windows and balconies raising Albanian Flag. A parade with motorcycles was the novelty of this year's celebrations. 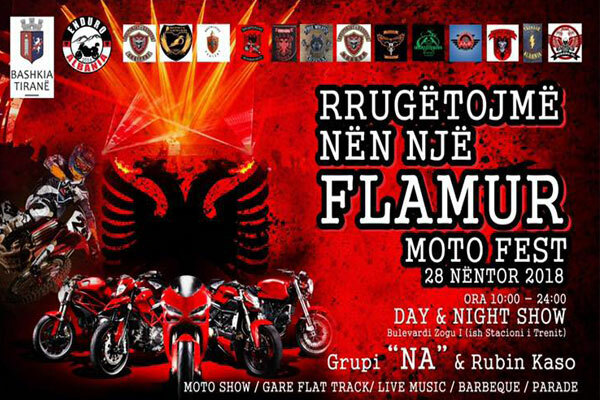 Moto Fest, took place at Boulevard Zogu I, from 10.00 to 24.00. Motorcycles with flags paraded throughout the city. 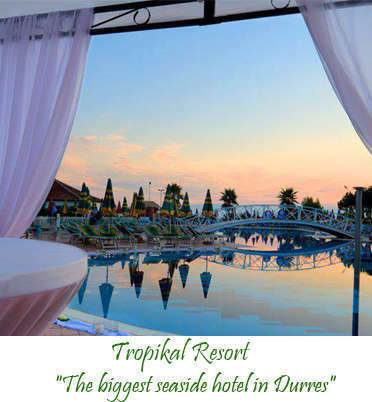 All this atmosphere was accompanied in the evening with live music from the group "NA" and Rubin Kaso. Parade, barbeque, racing, live music and many other things buzzed the capital for the 106th Independence anniversary. 2018 is the Nationwide Year of Scanderbeg, and on these national days COD (Center for Openness and Dialogue) located in the lobby of the Prime Minister's Office, opened the doors for the exhibition of the original and rare artifact brought from Italy. The entrance in all Public Museum and Galleries was free on the National Days. The National History Museum, as part of the events for Skanderbeg Year, during the national holidays of November opened the exhibition of paintings with 50 famous artists who have portrayed the figure of Skanderbeg in their works. The exhibition will be open at the Main Hall of the National Museum until 06.12.2018. The House of Leaves Museum, and other galleries were also free, and many citizens used the opportunity to visit them. Children were part of all activities on National Days. 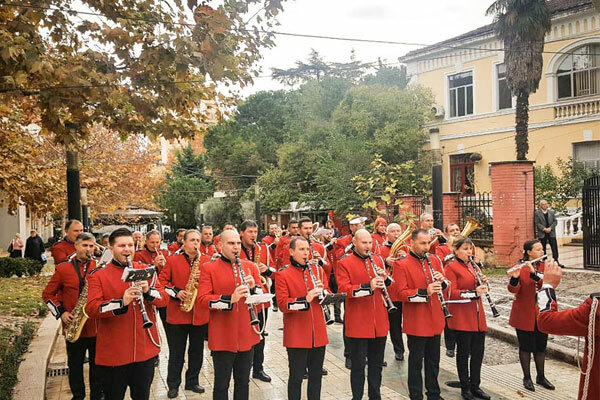 The main activity organized by Tirana Municipality is called ‘Colors of November’ and included: concerts, circus, paintings and different games. November 29th, a long night, where the city thrive with art activities, performances, installations, movies, turning the “White Night” a cultural event that brings Tirana closer to many European cities. It was a fantastic night full of music at Scanderbeg square with famous singers like: Aurela Gace, Elhaida Dani, Vesa Luma, Erik Lloshi, Krenar Seiti, Melisa Magnaneli, and Xheisara.